Shows featuring Wanda Williams-Bailey | Democracy Now! 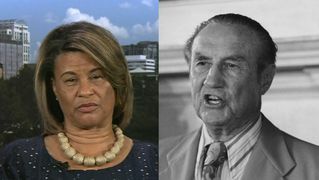 Granddaughter of the late South Carolina senator and segregationist, Strom Thurmond. She was there Thursday when Gov. Bailey signed the bill authorizing the removal of the Confederate battle flag from the Capitol grounds.